A set of sources may be treated as multiple point sources that are coadded together for spectral analysis or as a single, multi-source region. The appropriate Response Matrix Files (RMFs) and Ancillary Response Files (ARFs) are created for each spectrum. In the latter case, the responses are weighted because the RMF and ARF vary with detector location: the RMF is defined as constant across FEF tiles, whose size depends on both the position on and focal-plane temperature of the ACIS chip, while the ARF varies with position in the detector plane. The specextract script automates the analysis for each case when combining data from separate observations. Last Update: 7 Dec 2018 - Updated dmmakereg output for ds9 v4.1 syntax used in CIAO 4.11. Updated fluximage to create the PSF map. unix% pset wavdetect scales="2 4 8 16 32 64"
The source list has been edited to remove the three sources associated with the cluster (Figure 1) and to require a minimum of 100 net counts in the source (this latter constraint is just to reduce the number of sources to a manageable level for this example). A pointlike spectrum, an aperture-corrected ARF, and an RMF are extracted for each source in the list. The spectra and responses are then coadded for the spectral analysis. For a step-by-step explanation of the analysis, read the Extract Spectrum and Response Files for a Pointlike Source thread and the Coadding Spectra and Responses thread. The weight parameter is set to "no" to tell the script to make a pointlike ARF and the correctpsf parameter is set to "yes" so that arfcorr will be run to correct the ARF. The final pset - combine=no - means the specextract will not combine_spectra to coadd the spectra and responses. Earlier versions of this thread ran with combine=yes however, that is only appropraite when combining data from different observations. Since this thread is combining data from the same observation, it must be combined seprately. Aspect solution file pcadf131209709N003_asol1.fits found. Updating header of 3c294_src1.pi with RESPFILE and ANCRFILE keywords. Updating header of 3c294_src1_grp.pi with RESPFILE and ANCRFILE keywords. Note that combine_spectra ignored any grouping flags in the input spectra, so the output spectrum is ungrouped. It may be grouped using dmgroup or using the sherpa grouping commands. Proceed to the Fitting section for instructions on how to analyse the data. A weighted spectrum and response files are extracted from the set of sources, essentially treating them as an extended source. For a step-by-step explanation of the analysis, read the Extract Spectrum and Response Files for an Extended Source thread. Note that unlike the point-source approach, we use the default settings for the weight, correctpsf, and combine parameters, namely yes, no, and no respectively. ACIS parameter block file repro/acisf131209384N003_pbk0.fits found. Updating header of field/combined.pi with RESPFILE and ANCRFILE keywords. Updating header of field/combined_grp.pi with RESPFILE and ANCRFILE keywords. Either source spectrum can now be analyzed - using the related ARF and RMF - in Sherpa, as described in the Introduction to Fitting PHA Spectra thread. 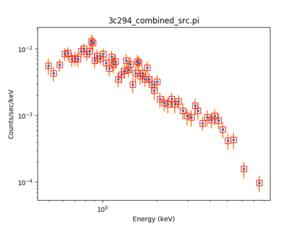 The red curve shows multi/3c294_combined_src.pi and the black curve field/combined.pi, both having been grouped to 20 counts per bin. The spectra combined in this way for data in the same observation are the same. In these examples, we used the detected counts to weight the responses, when what what we really should be using is the incident flux - i.e. the source spectrum before it passes through the telescope/detector system. If we assume an incident spectrum, we can correct the detected counts to give the incident flux, and use that for the weights. Since we do not know the source spectrum, we can use an iterative scheme - where the best-fit spectrum of the source from the previous iteration is used to correct the WMAP for the current iteration, until the results converge. An alternative scheme is to continue to use the detected counts - i.e. make no correction for the telescope/detector response - but only use a restricted energy range where the response + model does not vary much; an example being the soft energy band for clusters of galaxies. The spectrumfile parameter of mkwarf accepts an ASCII file containing a model of the source spectrum, which may be created by running the Calculating Spectral Weights thread. Note that the energy range of the spectral model should match that used to create the WMAP. 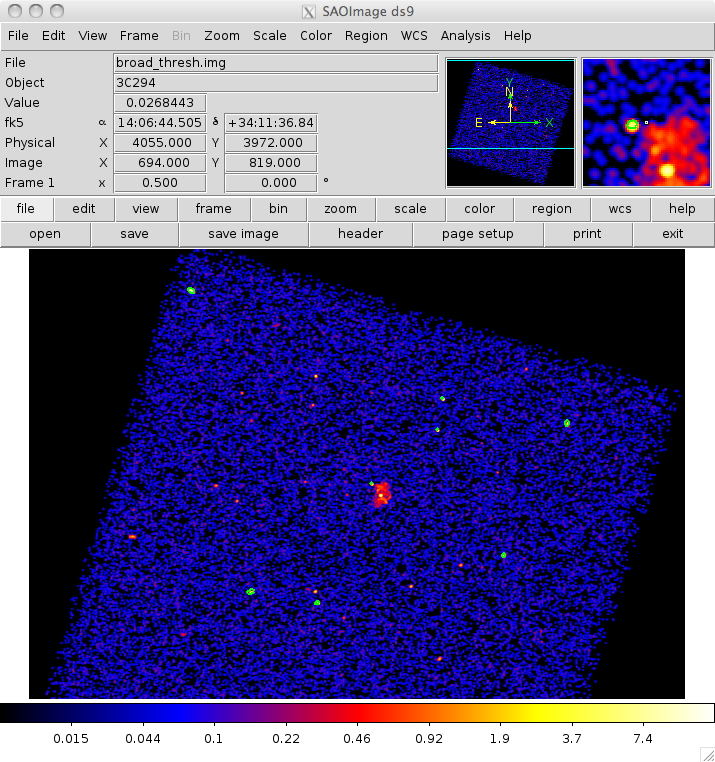 At this time specextract does not accept a spectrumfile. Note that, unlike mkinstmap, the input spectrum does not need to be normalized to unit flux. The algorithm used to calculate the weighted responses requires that there are no spatial variations in the source spectrum. (combine = yes)             Combine ungrouped output spectra and responses? 09 Mar 2010 The ACIS detector is calibrated over the range 0.224004 - 12 keV; choosing values outside this range may result in errors from mkwarf. 26 Apr 2011 install version 2 of the tools package for CIAO 4.3 to fix the mkrmf bug. 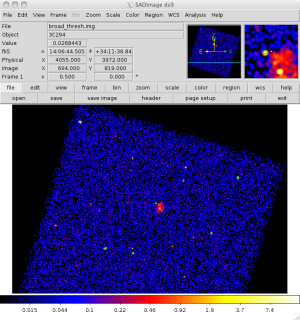 05 Mar 2012 revised for CIAO 4.4 (previous title was “Weighting ARFs and RMFs: multiple sources”): thread rewritten to show two cases - stack of sources and single, multi-source region; analysis is done with the specextract script. 08 Aug 2013 Updated for the contributed scripts 4.5.4 release: the "ancillary" files - e.g. aspect solution and bad-pixel files - can now be picked up from information in the event file (in many cases). 23 Dec 2014 Review for CIAO 4.7. 30 Jan 2017 Updated for CIAO 4.9. Replaced the combine=yes step in specextract with a separate run of combine_spectra. 07 Dec 2018 Updated dmmakereg output for ds9 v4.1 syntax used in CIAO 4.11. Updated fluximage to create the PSF map.